Today hundreds of workers from the J & M Clothing Co. gathered outside the Karachi Press Club to protest the brutal beating of eight of their co-workers by the Pakistani Rangers (a paramilitary force tasked with ‘keeping the peace’ in Karachi). The incident that provoked the clash took place a few days ago. 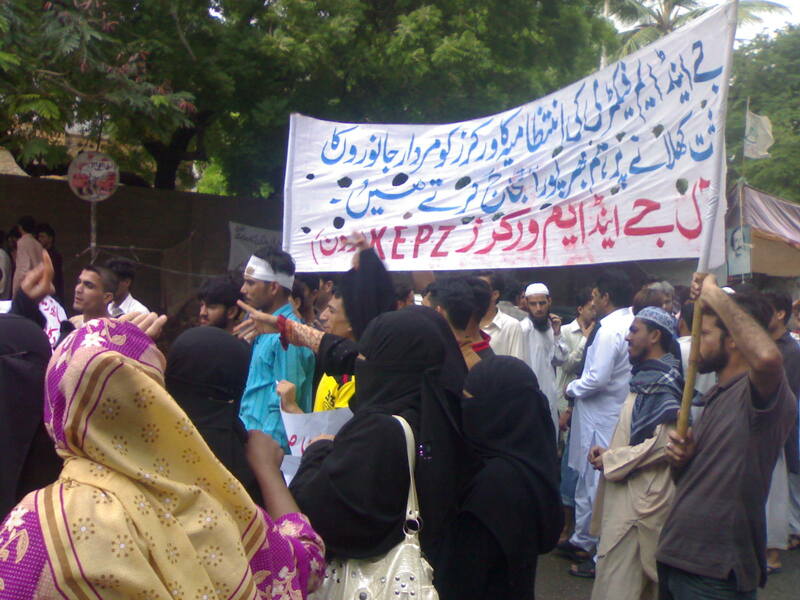 After being served rotten meat by the canteen at their factory (a privilege which costs them 300 rupees a month), the almost 2,000 workers employed at the establishment, reportedly the largest factory in the Karachi EPZ, took out a spontaneous protest against management. Unions are, thanks to the treacherous provisions of Pakistani labour law (PDF), illegal in the export-processing zone, but workers have been organized under the aegis of what they refer to as a ‘committee’. Unfortunately, the president of this committee has long been in the pocket of management. After affairs escalated, the Rangers were summoned–two supervisors (one of them this ‘committee’ president) fingered a few workers as the protagonists of the agitation. They were ordered to leave the factory. After they refused, the Rangers attempted to make an example of them–kicking them in the shins, beating them with sticks (one worker laughed as he told me they broke one on his back), etc. 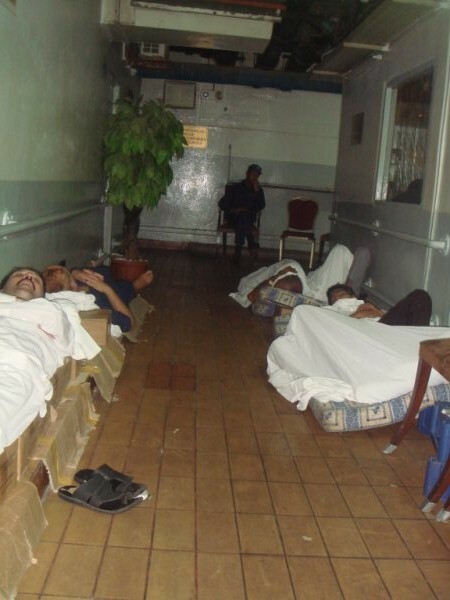 Two workers were beaten unconscious, only recovering later that evening at Jinnah Hospital. Apparently a few others fainted from the shock, as everyone around (including the Rangers, who promptly scattered) had presumed these two dead when they collapsed. Amidst the tumult, eighteen workers, including the injured, were handed letters informing them that they’ve been fired. Since then work has ground to an almost complete halt at the factory. With the exception of a couple of hundred largely Sindhi workers (who, I was told, are insulated from the rest of the workforce by a combination of clientilistic ties to supervisors and proximity of their residence to the factory), the plant is united in refusing to return to work until the two guilty supervisors have been removed, and all unjustly fired workers rehired. Aside from the obvious, welcome militancy of these workers, several things stand out about the action. For a city rent by a recent spate of target killings and a country assailed by the rhetoric of imperialists and fundamentalists alike, the explicit cross-ethnic solidarity displayed by the protesters and the prominent involvement of women was very heartening, to say the least. Of course, the hopes of the armchair observer need to be tempered by what activists see day-in day-out, which–last I asked–is not much. 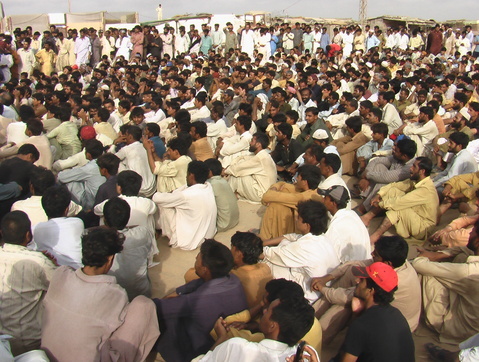 Needless to say, there are those congenital obstacles to workers’ activism in Karachi–high levels of unemployment, as an estimated 40,000 people migrate to the city every month in search of gainful employment; the informalization of the worker’s relationship to his/her employer; the aforementioned ethnic divides; the strength of reformist and clientilistic solutions to workers’ grievances (the J & M protest was delayed by a day, for example, after representatives of the ANP promised to organize eventually unsuccessful talks with management–there are several similar stories in which they have swooped in to ‘mop up’ and contain the mess made by Capital). One can only hope that the urgency of the plight of our working-class serves as pressure enough to render impotent these barriers to its self-organization. Goodness knows we need it. PS: In case anyone is particularly moved by the unveiling of the ‘fetishism of the commodity’, this page lists the many clients of the larger group to which the J & M Clothing Company belongs. Via Farooq Tariq comes this heartening update from Faisalabad. After the heinous murder of the two Christian brothers yesterday, one could not really hope for better news. Building the strength of the Left, it scarcely needs repeating, is integral to the fight against religious fundamentalism. In the LQM there is the promise of an alternative common-sense–around class, exploitation, poverty–which, in the short or long-run, is the only antidote to the poison being spewed by the right-wing. It was a day of workers in Faisalabad. All efforts of police and the bosses to fail the strike and rallies were stymied by brave and courageous action of the virgin proletariat. The bosses fired at workers. They pelted stones. Police used a record number of tear gas shells and baton charge. When this did not work to prevent workers coming on the streets in thousands, police also started throwing stones on the workers. Section 144 that prevents public gathering was just a piece of paper. The end result was a partial victory for the power looms workers. They were part of the main news in all the private and public television channels in Pakistan. Most of the media reports were accurate and presented a very fair account of the events. They all reported that violence was started by the bosses and their security guards and also by police. What was the violence: a factory was burnt down, a police motor cycle was set on fire and that is all. The media reported that the owner of the factory fired at the workers injuring several. Workers in retaliation went to teach a lesson to the boss and burnt the factory. When police started firing tear gas shell in Ghulam Mohammed Abad area, workers retaliated and police ran away leaving their motor cycle behind and it got fire. For most of the day, Faisalabad saw some glimpse of the 1970s when the workers controlled the city. Today the whole city witnessed the power of the working class once they move in action. They were everywhere and police was unable to control them. The media reported that Faisalabad was a city of war between power looms bosses, police and the workers. Women came in the fore front to confront the police as well. The youth played the leading role. The media blamed the administration of not listening the LQM demands in time. Today after the whole day of confrontation where workers had the upper hand, the administration assured the leaders of Labour Qaumi Movement that all their demands will be met once the workers are off the roads. The LQM leadership has all that in the past. They negotiated and told the administration that strike will not be over until the demands are met. Over 100,000 workers took part in a strike at more than 20,000 power looms factories in the city. The call was given by LQM leadership on 16th July at a public rally in Jhang where workers are already on strike for 15 days. Police and the bosses did not take this warning seriously. Today they must be regretting of this opportunity given by LQM leadership. They miscalculated. They would have thought that the two leaders of LQM murdered on 6th July in their office by some 10 gangsters must have a demoralizing effect on the will of the working class to act. The demands of the workers were simple. They said implement on the wage increase fixed by the government. This was mere 17 percent. Public sector workers have got 50 percent this year. The year saw one of the most known expensive years in the history of Pakistan. The Pakistan Peoples Party Government have withdrawn all subsidies and increased the prices of electricity, gas, petroleum and almost all the house hold items. It was an IMF agenda. The price hike was ten folds. Every single family was affected. A mere 17 percent: that was all the workers were demanding. However, the Punjab government had other plans. They brought one of the notorious police officer to head the department, Mr. Aftab Cheema known for fake police encounters and killings the criminals. He was eager to show to the leaders that he is Aftab Cheema. Yesterday, almost all the main leadership of LQM was threatened by police inspectors. Today, police from six different districts were called in to Faisalabad. This was all to stop the peaceful action of the working class. They could not do that in front of the might force of the working class once they came in action. Police firing actions were live telecasted by all the news channels and they also showed that workers fighting back. The power looms workers revived the Intifada movement. Stone pelting youth in front of rifles and guns were the most common scene on all the television channels broad casting the actions oriented events of Faisalabad. The will of the working class to change their situation can never be defeated. I will address a press conference tomorrow at 3pm at Lahore Press Club along with the main leaders of LQM to tell that the movement will go on and will be spread to other districts as well. Labour Party Pakistan leading members met in Lahore today to chalk out a strategy to support the movement. It was decided that National Trade Union Federation will organize a massive rally in Lahore on 6th August in solidarity with the power looms workers and to demand an immediate implementation of minimum wage in all the private institutions. A Workers Solidarity Conference will be organizing in Lahore by labour Party Pakistan in the second week of August. All the trade unions and social movements will be contacted for these actions. An urgent update from Gadani, where the union has announced an indefinite strike after the promised agreement heeding their demands never materialized. More on this very soon. An emergency meeting of office bearers of Ship Breaking Democratic Workers Union, representing 15,000 ship breaking workers, held at the union office today. The meeting was presided over by Rafiq Baloch, president National Trade Union Federation(NTUF) and attended by representatives of all 40 sites of ship breaking industry. All representatives of the union discussed the prevailing situation at ship breaking yards and workers anger and fierceness due to breach of agreement by the ship breaking owners which bounded the owners to accept the demands of workers till 30th June and workers called off their strike in accordance with this agreement on 16th June till 30th June. Taking stock of the situation and also keeping in mind the militant mood of workers it is decided unanimously call for indefinite strike from 5th July till the acceptance of workers demands. 10,000 pamphlets with appeal to workers for successful strike is being distributed among workers of all technical categories now. A “Workers Strike Committee” having seven members is formed to take all emergency decisions. National Trade Union Federation with whom Gadani Ship Breaking Democratic Workers Union(GDSBDWU) is affiliated has endorsed the strike call and announced full support and solidarity with ship breaking striking workers. NTUF will lead a full day “Mazdoor Dharna” on 3rd July, Saturday from 7am to 5pm at Karachi Press Club in solidarity with ship breaking workers where thousands of workers show their power with red flags. We appeal to all pro workers individuals and organizations please show your solidarity with struggling workers of Balochistan against the ruthless capitalist exploitation. The 15,000-strong Gadani ship-breakers‘ strike was suspended last week, after the owners promised to heed the workers’ demands by the 30th of June. The draft agreement to this effect was approved at a meeting of the union on the 16th, which was attended by some 3,000 workers from the dozens of sites across the shoreline. The workers remain wary of the intentions of their employers, of course. The owners’ association has offered the union a 20% increase in compensation–but, as the press release appended below makes clear, not only is the concession trivial in relation to the rising cost of living (and in relation to the super-profits made by owners and contractors alike), it addresses only one of the several demands made by the union. Only two days ago, for example, a 25 year-old worker fell to his death while working on a ship’s ladder in near-darkness. A harness would have saved him. At a press conference in Karachi yesterday, representatives of the Ship Breaking Democratic Workers’ Union emphasized their readiness to take further strike action. Suspicions are that the owners’ association will stand its ground, and full preparations have been made for a further round of struggle. A translation of the full press release is after the break. Messages of solidarity can be sent to progpak[at]gmail.com, or to ntufpak[at]gmail.com. Recent media reports suggest that a father of five killed himself by taking poison after he could not buy food for his hungry children. In another case, a widowed mother of three killed herself after giving poisoned milk to her three children. A young mother in Lahore tossed herself and her two young children onto a railway track allowing an approaching train to cut them to pieces. In a suicide note she cited poverty and increased hardship due to inflation as the reason for her decision. A young man committed suicide at Aabpara Chowk in Islamabad by shooting himself. The suicide note that he left behind—one part addressed to his family and another part to society—blamed the rich, as well as the price hike, load shedding and poor housing policies for getting youths like him into the trap of usurers and thus despair. PC Hotel occupation ended today at 9pm (on March 20). 1 of 4 activist restored. the other 3 will be restored in 10 days. Mangt forced to negotiate w union President Nasir. Jubiliation amongst occupying and protesting workers as they meet intside the hotel after 26 days of a brave occupation and strike by over 150 workes. 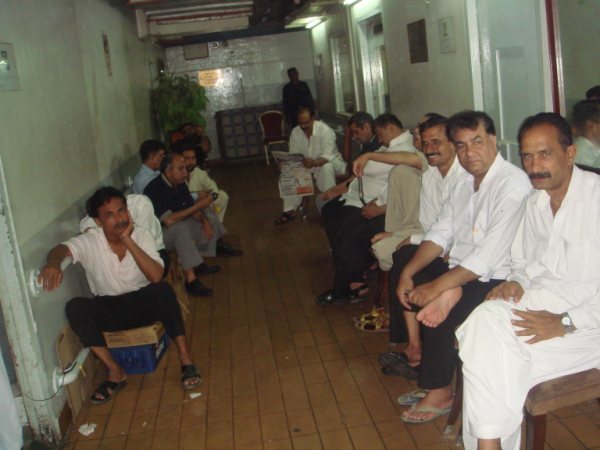 Its a workers’ victory, said Ghulam Mehboob Secretary of PC Hotel Workers Union…. Ghulam said the management (Aslam Siddiqui, PA to Hashwani [owner of the PC]) was forced to negotiate with union President Nasir in the basement today where over 150 workers were occupying. Its a small but significant victory for PC workers. The union remains intact, workers restored partially and above all the management was forced to negotiate which it has avoided since 2002 when it sacked over 300 union members, including office bearers of the union (except the 4 which were sacked on Feb 24 and now restored). The occupation goes down as a wonderful example for the working class in Karachi. A fantastic step in the larger struggle. All issues are obviously not resolved, and we’ll bring you news about what’s next. Meanwhile, workers at the tire factory are still protesting. You are currently browsing entries tagged with workers at .